St Petersburg Tourism Russia | An Overview! St Petersburg tourism, as in all of Russia, has seen rapid growth since the late Soviet Times. Once a swamp, today one of the world's great metropolises, Saint Petersburg is considered the grand gateway to Russia and its unique cultural treasures. Entrance to Hermitage Museum at the Winter Palace. Included in the UNESCO list of sites with world cultural legacy for its elegant architecture dating to the 18-19th centuries, and its triumphant monuments and museums along with a vast wealth of art and history, there is no doubt that the imperial city is the most important cultural city of Russia, and maybe the world. As a result of that millions of international tourists have already visited Saint Petersburg from Finland, Germany, the USA, Sweden, Italy and France as well as Korea, Thailand, India, Japan and China (all leading countries), and the list probably may grow in the near future, though things can also change at the last minute due to the current international political tensions between the West and the East. We hope not of course! In 2005, when 3.5 million tourists came to the city, the Russian government set a target of attracting five million tourists by 2010, which it succeeded in doing. In fact, from 2006 to 2010 the government invested in a development program for tourism, that cost about 519 million rubles ($670 000 000), in order to improve the infrastructure of the city, open new hotels and new facilities for tourists. On the other hand, the contribution of tourists to the city's economy in the form of direct costs (excluding the cost of coming to St. Petersburg), based on the city government report in 2010, was more than 115 billion rubles. New investments for the incoming years are right now underway! 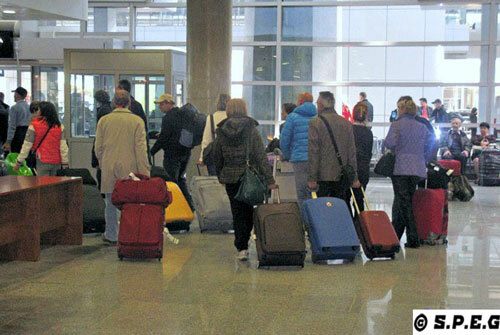 Arrivals of tourists at the New Pulkovo Airport. As a result of the Russian government investment, and according to the committee for investments and strategic projects of St. Petersburg, in 2014 the city was visited by 6 million tourists, which saw an increase of 8% compared to the previous years. More than 3.5 million foreign travellers visited the city, with an increase of 13% from the previous years. Another 2.5 million Russian tourists came to St. Petersburg, an increase of 3.5% compared to 2014 and 2015. In 2017 the city set a new target of 10 million tourists by 2018 and announced a plan to make the North capital of Russia more tourist-friendly. New and fresh statistics from the official tourism office say that about 7 million tourists visited the city in 2016, 4.7 million were Russians, the rest were foreigners. Instead 2017 was a record year for Saint Petersburg. More than 8 million arrivals to the city were recorded with domestic and international ones split 50/50. Transport companies, major museums and other entities have also seen record-breaking growth rates. So, we think 2017 was successful for St Petersburg tourism in terms of overall number of tourists and profitability, and we hope that the current year will be even better. Due to the large government development program over the past years, and the gigantic historical and cultural value of Saint Petersburg, undoubtedly this city truly has become the most visited Russian city, and one of the best tourist centers of Europe. In addition to that, the growing trend can be also confirmed by other elements such as the introduction of the Visa Free Travel option for cruise travelers; the Sapsan train’s ridership on the St. Petersburg - Moscow line; and the Allegro train (St. Petersburg - Helsinki), which have made the access to the imperial city easier, faster, and much more convenient for travelers all over the world. All of these factors led to in an increase number of new visitors year after year. As a proof of that, Russia's Northern Capital today ranks as one of the most beautiful cities in the world along with Paris, London and Berlin. It became listed as the Travelers' Choice Winner in Trip Advisor for the top ten best destinations in Russia, and for the following years: 2013, 2014, 2015, 2016; and recently it has also been listed as one of the best travel destination in the world for 2017 by TripAdvisor. So, we are wondering now... When will you come? If you have not been here yet, then you really should come! Don't be misled by the negative propaganda or funny myths you may have heard in the past from the Western media. Leave the political turmoils apart and take the plunge. Discover this vibrant and cultural Russian city in complete serenity, and see for yourself why St Petersburg tourism has gown so fast in the past years.